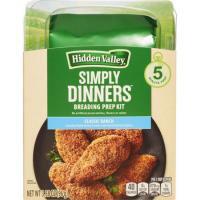 Making crispy chicken or pork is shamelessly simple with this five-minute breading prep kit. Just dip, coat and bake. Includes two easy-cleanup trays for dipping and coating, plus a panko breadcrumb + Parmesan and Three Herb Ranch seasoning mix. I love your ranch. Thanks so much. It's so so good.